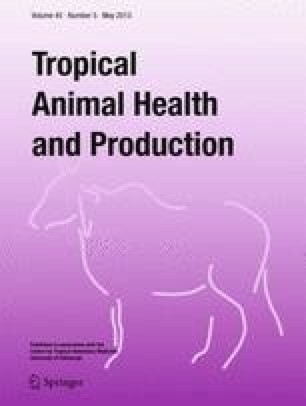 The objective of this study was to determine the association of metabolic parameters and cow associated factors with the conception rate at first insemination (FCR) in Thai dairy cows. The investigation was performed with 529 lactations from 32 smallholder dairy farms. At 3–6 weeks after parturition, blood samples and ruminal fluid were collected. Body condition scores (BCS) of cows were scored 1 week before expected calving date and at blood sampling date. Ruminal pH was measured at 2–4 h after morning feeding in ruminal fluid collected by ruminocentesis. Serum beta-hydroxybutyrate and serum urea nitrogen were measured by kinetic enzyme method. Cows with first insemination (AI) between 41 and 114 days postpartum were identified after pregnancy diagnosis for FCR. Breed, parity, interval from calving to first AI, BCS before calving, BCS after calving, loss in BCS after calving, SBHB, SUN, ruminal pH, and postpartum problems were selected as independent variables for a model with FCR as a dependent variable. A multivariable logistic regression model was used with farm as a random effect. Overall FCR was 27.2 %. The FCR depended on interval from calving to first AI, BCS before calving, and ruminal pH. The FCR between 69 and 91 days postpartum was significantly highest (45 %). Before calving, a cow with high BCS (≥3.5) had significantly greater FCR than a cow with low BCS (≤3.25; P < 0.01). An increased ruminal pH raised significantly FCR (OR = 2.53; P = 0.03). The authors thank Thailand Research Fund (TRF) for providing grant for this project and the farmers who cooperated in this study for their support.